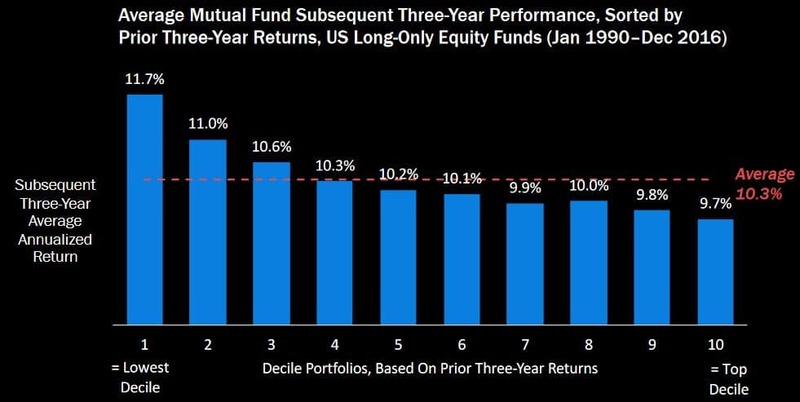 If I told you that your best chance of finding an investment fund that is going to outperform in the future would be to screen for the worst performing funds in the past, you might think I was crazy. But one of the things we like to see when we’re looking for exceptional fund managers is a great long term track record, coupled with not so great short term performance. A recent study by a respected investment firm has found that there’s a lot of sense in that approach. The study was conducted by Research Affiliates, a US firm specialising in asset allocation, smart beta, and active equity investment strategies. The research looked at Morningstar data for US managed funds for the 27 years from 1990 to 2016. They analysed the data for each three year period. Then they ranked the funds in ten different “deciles” from best to worst performers. Finally, they then looked at the performance of each decile over the subsequent three years. The results are below. Based on Research Affiliates work, we can see that the top 10% of funds over each three year period went on to underperform over the next three years by 0.6%pa (9.7% vs 10.3%). The 10% of worst performing funds over each prior period produced returns of 11.7% per annum, a significant 1.4% above average. While this seems counterintuitive, it’s very similar to what we experience here in Australia. And it makes sense to us. Here’s why. You’ll see from the data in the chart above that the average fund (the 5th and 6th deciles) underperforms by 0.1% to 0.2% per annum. Think of those funds as the passive or index funds. They will deliver the same performance as the wider market, minus fees and costs. The funds in the middle, comprising deciles 3, 4, 7 and 8, are likely to be those that are moderately active. They have some flexibility in their investment strategy. But they tend to still perform in a similar way to the wider market. At each end, we have the most active funds – those that deviate most from the market benchmarks. The reason the most active funds have the widest range of results comes down to how they invest. For any fund to be able to outperform significantly over the long term, they must hold a portfolio of investments that is very different from the index. They usually achieve this by holding a more concentrated portfolio, by specialising in a certain area (e.g. smaller companies) or by adopting a strategy that allows for differentiation (e.g. being able to hold significant cash from time to time). These differentiating features mean the fund can outperform over the long term. But it also means they can, and do, underperform as well. So, investing differently can lead to very good outcomes, but with the chance of also achieving poor outcomes. Even the greatest of managers have times when they lag the market. Sometimes, performance coincides with market conditions. For example, for much of the past two years, growth-focused funds have materially outperformed value based funds. That doesn’t mean every growth manager has outperformed, but it is more likely to be the case. Sometimes performance is cyclical for other reasons. For example, fund managers with concentrated portfolios tend to go through “realisation” periods, when a number of their ideas come to fruition and performance is exceptional. They similarly can go through “renewal” periods, where they are buying into new ideas that can take 2-3 years for value to be realised. Results can be poor during these renewal periods. Whatever the reason, it is almost inevitable that all active fund managers will perform poorly from time to time. Markets are not as efficient as you might expect. Sectors and stocks often fall in and out of favour. As investor confidence and sentiment rises and falls, valuations can change dramatically. And while undervalued and overvalued stocks can stay that way for a while, eventually mean reversion kicks in and valuations head back towards normal. In many instances, they also then overshoot the other way. So, when undervalued and out of favour assets finally get noticed, they can, and quite often do move past fair value and become expensive. Various studies over time have confirmed that investing more into assets that are relatively cheaper than average, can lead to superior long term returns. So, managers and funds are more likely to outperform over the long term following a period of below average performance. This is because the largest laggards are more likely to include assets which are highly active (i.e. different) in their portfolio construction and to hold assets whose value is underappreciated by the market. When constructing the portfolio of managers, our first three rules are diversification, diversification and diversification. We work hard to make sure the portfolio of funds we chose to invest in is varied by manager, sector, asset class, geography and investment style. Only once we’ve done that, do we seek to tilt the portfolio towards those managers, strategies and asset classes we feel are most undervalued. Quite often, these are also areas where performance has not quite kept pace with the market over the past few years. Right now, we are overweight value managers, small company managers, cash and alternative investment strategies that can outperform in poor markets. We’re underweight the US stock market, commercial property, bonds and high growth stocks. We review the performance of all our managers regularly. We’re more likely to add more to a manager we admire that has had a rough period, rather than one that’s performed spectacularly for the past few years. It’s not for everyone. It takes patience, discipline and a contrarian streak. But we believe that over time, it adds value. We encourage you to do your own research before making any investment. A great LIC, investment fund or manager is only part of the story. We also like to make sure they’re trading at the right price and that the assets they are investing in are not themselves overvalued. We explain how we do this in our LIC Guide and our Managed Funds Guide, but in the end, it’s up to you to make the investment decision that’s right for you, in conjunction with your financial advisor if you have one.